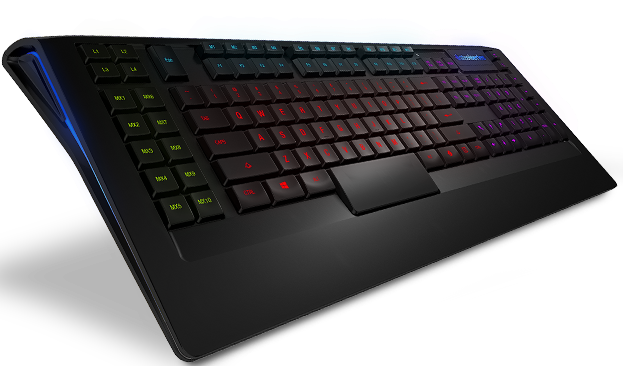 Also dubbed as the 'world's fastest gaming keyboards', SteelSeries certainly gave an impression during the recent CES 2013, but what catches the eye I believe, is the fancy-looking, brightly-illuminated keys on this beautiful device. Boasting 5 independent zones for 16.8 million colour illuminations each, with 8 levels of intensities, combined with an extremely sleek design and low-profile keys, you can pretty obviously see how much effort SteelSeries has put in for the Apex. But within this beauty, lies a foundation of varied features for the most optimized and 'fastest' experience. The biggest of all, you will notice, is the number of additional macro keys it boast - a whopping total of 22 on the left and at the top. And if that isn't enough, each of the 22 macro keys feature up to 4 layers of different functions potentially summing to 88! That's a whole lot of macro keys and to add it up another notch, the Apex feature additional media keys and even arrow keys for some 'extra directional convenience'. What's also interesting is in the midst of the number of keys basically flooding the keyboard, SteelSeries bumped its W key up a little to add a sense of recognition to retreat back to WASD keys without the need to find them. This slight but important detail they put in really do show how much a beast and possibly a flagship keyboard SteelSeries intends the Apex to be. For the Apex [RAW], though how it kinda sounds much cooler, is actually a lower-end model. Carrying a similar sleek design, the Apex [RAW] however only consist of white backlit keys and 17 macro keys with 2 layer of programmable functions. Both the SteelSeries Apex and Apex [RAW] are set for a second quarter release and will be priced at $100 and $70 each. Visit steelseries.com/apex and steelseries.com/apexraw for more information.